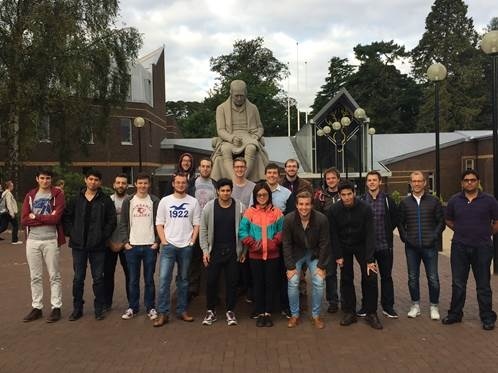 Our cohort 1 researchers Dimitris and Adrian attended the 14th International Conference on Manufacturing Research (6-8 September 2016, Loughborough) (http://www.icmr.org.uk/) where they had the opportunity to present their paper entitled “An application of autoregressive hidden Markov models for identifying machine operations”. The paper introduces a novel application area for a well-proven machine learning algorithm, aiming at intelligent monitoring of energy consumption of production machines. The proposed method will facilitate the rescheduling of production operations with reduced energy waste and can result in significant electricity cost savings for the industry. This work is part of a bigger picture project undertaken by the Intelligent Systems research group, following the European Union 2020 directives to improve the energy efficiency by 20% and reduce greenhouse gases by the same percentage, compared to the 1990 levels. The group also participated with two more papers in the conference, outlining their work on component traceability under the aspect of the upcoming Industrie 4.0. Our researchers’ work was presented under the thematic area of advanced manufacturing technology, while researchers from leading universities and research institutes from all over the country presented advances in a range of topics such as additive manufacturing, product design and manufacturing materials. Being UK’s main manufacturing research conference for over 30 years, ICMR 2016 was a great opportunity for networking and forming of cross-disciplinary collaborations. The conference concluded with a JCB factory tour in Rochester. 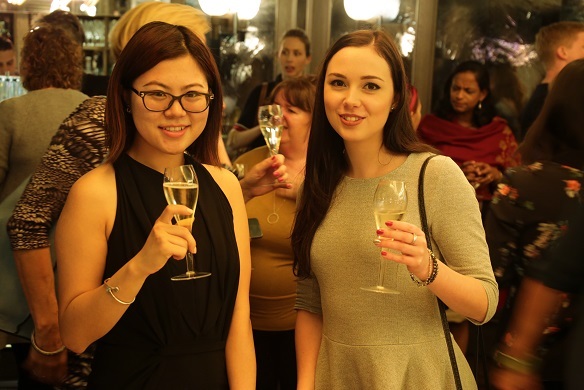 Cohort 3 research Orange Gao (left in image below) attended the Women in Machine Intelligence in Healthcare Dinner. RE.WORK, an all-female company which is a strong advocate for supporting female entrepreneurs and women working towards advancing technology and science, organized an evening dinner event of discussions & networking around the progress and application of machine intelligence within healthcare on Wednesday 12th October 2016 in London. Dinner and presentations commenced at 7pm and finished at approximated 10pm. RE.WORK invited 50 attendees from leading academics, industry experts and entrepreneurs. During the dinner, speakers gave wonderful and insightful presentations about the new trends and ideas around the Machine Learning in health. Dr Kathy Goetz, VP partnerships & solutions from IBM Watson Health mentioned “The future of Healthcare is cognitive.” Dr Alice Gao, research scientist and engineer from Deep Genomics shared her work about “developing a scalable workflow for training molecular phenotype models.” Dr Razia Ahamed from Google DeepMind gave a speech about “Getting support for new ways of delivering healthcare.” People had the chance to openly discuss emerging and advancing techniques and the speakers enjoyed the lively discussion that followed. The event was a great success. RE•WORK provided a unique mix of technology, from the exploration of latest scientific findings to startups that can make them a reality. Attendees can gain knowledge and skills from collaboration and brainstorming with global experts. The Institute of Physics (IOP) hosted at University of Leeds the most important optics and photonics conference in UK, the PHOTON 16. In this conference the latest technologies in optics and photonics are communicated to the scientific and academic community. The main topics in the sessions were Advances in lasers, sensing and imaging, light matter interaction, quantum optics, devices and systems, ultrafast and attosecond optics. This event also reunite worldwide recognized plenary speakers from the most important universities and research centres around the world. The Synthetic Aperture Interferometry (SAI) group from Loughborough University participated in two talk sessions to speak about the main progresses in this optical project. Rob Middleton, a research assistant presented the work Design of a compact digital holographic camera with large numerical aperture. Meanwhile Ian Park, a CDT-EI postgraduate student, presented his project titled Characterisation of the reference wave in digital holographic camera, which describe an algorithm to find the correct position of the reference wave. That wave would be used to create the inference with the object wave to retrieve a holographic image of the object under study. Both scientific talks were well accepted by the audience which questioned the speakers about specific details of the addressed topics. In summary, Loughborough University and the PhD students from the CDT-EI are being part of the scientific divulgation of their high level research on the most important international conferences. Additionally, this is a perfect way to make a recognition to the institutions that are part of the research projects and maintain a position within the top universities in UK and the rest of the world. Over 26 and 27 September we ran a workshop for the Institute of Leadership and Management (ILM) qualification our students are undertaking. We were delighted to be joined by Rodney Jones, Assessment Manager at ILM. Rod provided a good overview of ILM assessments and what his team of assessors are looking for when they are marking assignments. A tutorial was also run for a number of the assignments that members of Cohorts 1 and 2 have completed. After lunch the students took part in a team building activity. 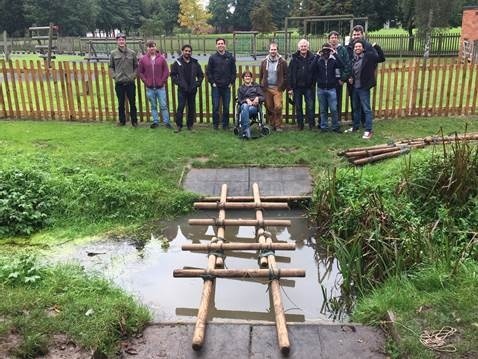 After a crash course in knot-making they were tasked with building a bridge, the catch was that all but one team member was blindfolded! The following day Cohort 3 attended a session dedicated to their transition to year 3. Dr Carmen Torres-Sanchez, Executive Director of CDT-EI, highlighted that the Transition Zone themes for year 3 of the CDT-EI programme are enterprise and communication. Dr Joanne Whitaker, Head of IP and Commercialisation at Loughborough University was the guest speaker on the day and was able to explain the complexity of collaboration agreements and IP exploitation. Dr Donna Palmer, CDT-EI Centre Manager, also gave an introduction to public engagement, why it is important and how you can get involved. Ruben Kruiper from Cohort 2 attended the Reasoning Web Summer School 2016 early September this year in Aberdeen, Scotland. Renowned researchers from several areas related to Semantic Web, Linked Data and Knowledge Representation gave tutorials on various subjects as e.g. Inconsistency-Tolerant Query Answering, Test Driven Ontology Authoring and the Linked Data Lab. Carsten Lutz kicked off the week with a talk on data access with ontologies, starting with the foundations and diving into the fundamentals of query rewriting. Other speakers included amongst others Magdalena Ortiz, Meghyn Bienvenu, Frank Wolter, Juan Reutter and Stefan Schlobach. After a midweek packed with high standard seminars the summer school ended with a social dinner in the city town house. Last week we formally welcomed our third cohort of students. The academic year starts with our annual retreat to the Burn in Scotland. The new cohort are introduced to our accredited Transition Zone training programme and start on their PhD journeys. Most importantly, the week allows the new students to get to know each other and to meet some of our cohort 2 researchers, who were able to pass on some top tips for success. Dr Andreas Schamel - Director Global Powertrain Research & Advanced and Director Ford Aachen Research & Innovation Center (RIC). Professor Mehrdad Ehsani - Robert M. Kennedy Endowed Chair Professor of Electrical EngineeringElectrical and Computer Engineering, Texas A&M University. These speakers and the researchers who presented their findings all have a significant impact on research and cutting edge technology on the automotive industry. CDT-EI member Robert Turnbull presented his findings on the coupled dynamic analysis of piston compression rings. Many of the sponsors had their own papers to present at PMC, and to show the future generation implementations to the modern road vehicles. Loughborough Dynamic Research group also organised a scenic train trip with a classic steam engine and first class Gala Dinner. The train trip went through the old unused stations. The stations were kept/made to feel the time of the 1900s. Members were also allowed to see the coal fuelled furnace. The nature of the atmosphere allowed many industry associates to see researchers in a more relaxed manner and allowed an exchange of ideas and thoughts in a non-formal manner, while giving a good setting for the following day. The atmosphere experienced that evening was described priceless. At the Galla Dinner Professor Homer Rahnejat, Professor of Dynamics gave a wonderful and memorable speech. Going from his past students making a difference to this world to the new projects being generated at the University. It is hoping that PMC 2018 will continue the success and the experience of PMC 2016 and the possibility of more papers being published both the Dynamic Research Group and the CDT-EI.